I was saddened to learn yesterday that Bob Franko, a board member of the Warrendale Community Organization as well as the Warrendale Radio Patrol, has passed away. His volunteer efforts often happened behind the scenes, which is one of the reasons why it was so hard for me to find a photo of him to include in this post. Over the past several years, he had helped the Warrendale neighborhood in numerous ways. Most notable of them was his leadership with the community block grants, which had brought more than $500,000 over the years to help low-income residents with home repairs. 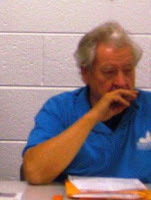 Mr. Franko had also been an active member of St. Thomas Aquinas Catholic Church for decades. There will be a memorial mass for him at the church this coming Monday.